– Trade with margin utilisation at a maximum height of contracts´ nominal value. Margin utilisation is a ratio calculated as margin/total account value. Margin is a financial amount that broker blocks when the position is being opened. Its height is set by the broker. Common height of margin utilisation concerning futures and forex is 1-10%. It means that the leverage that is being used is 1: 10-100 (100/10-1). If trader uses margin utilisation that is more than 10%, the amount of money which is more than available on the account is loaned from the broker and interest has to be paid, and more importantly it increases the risk that trader will not have enough money to survive higher volatility. That’s why conservative trader should trade with margin utilisation at a maximum height of contracts´ nominal value, which is 1-10%. – Some traders rely on the fact that in long term the prices have a tendency (sometimes after months/years) to get back to previous normal levels. That´s why using lower margin utilisation is important for long term investors to get over this period. – Also, short term volatility can be so high that using minimal margin utilisation is to only way to get over it without big losses. – Don’t forget that even big funds have average return 10-20% and they don’t trade with high margin utilisation. Lower yield coming from lower margin utilisation is much more important than potential risk coming from high margin utilisation. Money management (stocks) – concerning trading stocks and other assets which are not traded on leverage, but the total value of stocks/assets is equal to the invested amount of money, it is a good idea to build a portfolio in order to lower the risk. It means to divide the invested money into several kinds of assets. – None trader is able to make 100% of his trades profitable. It is common that successful traders have rate of profitable trades more than 50%. You can close nine profitable trades but when you are not able to close one trade that generate loss you can lose all the profit you gained at profitable trades. As the result you can lose all the money, what can lead to your bankrupt. – Ability to make proper stop loss is one of the hardest mental sites in trading. You have to realise that trading includes losses. The aim is to make losses as low as possible. – Wins bring the feeling of euphoria, whereas holding the losing position costs you a lot of energy and make you exhausted. 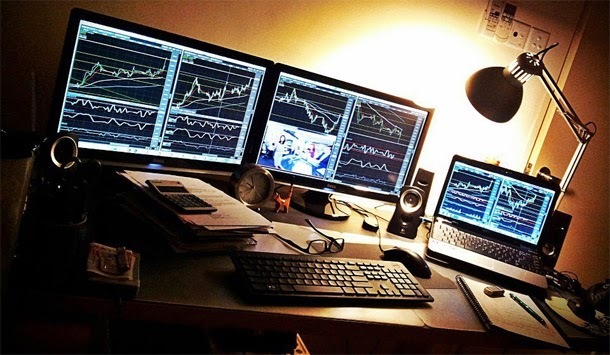 Holding the positions that generate loss can be so mentally demanding that trader can´t sleep, he constantly concentrates on the position and after days of physical and mental exhaustion he can make even much bigger and fatal mistakes that could lead to a bigger loss of money. – Prepare a plan of trade. It means at what price you want to open a position and what profit/loss you would accept. If the loss is higher than it was planned to be, close the position. Even if it is hard thing to do, you have to be able to make a loss in these trades. – Some traders don’t use stop loss and instead they rely that the price will get higher/lower at a level they see as an intrinsic value of an asset. This can be reached only by using a very low margin utilisation. On the other hand, other traders use stop loss very strictly. Concerning stocks, if you invest for a long term and trust in intrinsic value of stocks, you either might or might not use stop loss. – Open a position only if you are 100% sure that all conditions and analyses, which you have set for opening a position, have met. You have to avoid unclear trades. – Do not open position just because you want to play – it is gambling. The purpose is not to play but to make money. – You have to be patient. From time to time there appears a position that is very lucrative. If this position doesn´t appear for a long period, calm down – it doesn’t mean anything. At last after some time it will finally appear and that time be relaxed and open position. – After several profitable trades trader can have a tendency to be greedy and can open another positions less prepared. That time you have to watch carefully if you do not open positions under the influence of euphoria from previous successes. – When you have opened profitable position you have to stick to the plan and close the profit based on your plan. Greed and euphoria are very dangerous feelings the trader can possess. In this case, break helps. – If trader loses money in opened trade he can have a tendency to hold his losing position, he wants to get out of loss as soon as possible and be in panic. Also in this case break helps to calm down. You need to understand that lost money is already lost and you have to concentrate and be calmed down when trading. – Trading is very mentally demanding, not suitable for most of people and it shows mental strengths/weaknesses of person in wide range. Borders between trading and gambling (addiction) are very tight. – Positions should be opened based on as much fundamental and technical analyses as possible, because both fund. and tech. analyses are important. – Fundamental analysis mirrors the intrinsic value of an asset. Concerning commodities it includes the total amount of inventories. It is said that lack of commodity causes the increase of price, on the other hand surplus of commodity causes the decrease of price. Watch the total inventories of commodities through market reports. Through news watch the geopolitical, social and economic interests of other players. Fundamental analysis is the basis of overall price range. – Technical analysis can help you to predict specific levels of price according to a wide range of indicators, patterns and levels. In general it helps us to know probability with which the others look at the charts and according to which they decide. Traders use similar instruments of technical analysis and that´s why some movements are the result of the same chart-reading. Technical analysis is as important as the fundamental. – All traders at their beginning concentrate on the fundamental and technical analysis, whereas much more important are mental rules and money management. Trading is about probability. None analysis nor prediction is 100% sure. Constantly revaluate your strategies and close your positions immediately when you think you should. Strict following a strategy that´s going against you and using high margin utilisation at the same time is one of worst things you can do. It costs you lots of money and energy. Trade when you are relaxed and calmed, when you feel fresh and have enough time to think about trade, analysis, etc. Do not open position if you are not able to be logged in to your account afterwards. Trade only with money that you can afford to lose. Trading is just a game. Just like you believe in win and it can happen that you will earn money, you have to count with the risk of losing money. Almost every trader loses money at the beginning and more than 90% of traders lose all the money. Only tough mental self-discipline, knowledge, training and years of experience guarantee that you have a chance to succeed. Definitely try trading on demo account at first. Keep learning and look only for important information, such as reports, facts, and analyses. Do not trade according to other traders. If so, take the analyses of other traders just as an inspiration for your own analyses. Part of the traders will always be long and the second part will be short. Everyone goes public with profitable trade, but only a few with trade that made them loss. Successful trader is the one who is experienced in every part of trading, not the one who is trading according to the others. 10. Support this page, which is trying to help you providing information fast and user-friendly.